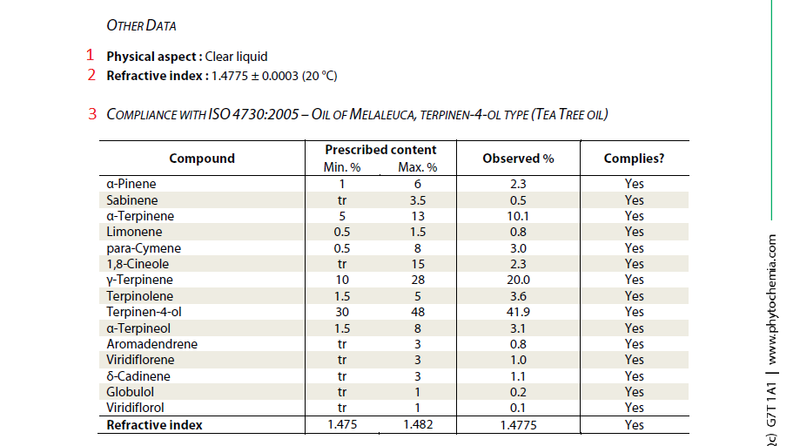 As more and more consumers are aware of the existence of essential oil adulteration, distributors are starting to offer GC reports with their oils. We believe that this is a good step for multiple reasons. It shows that the company has made its best efforts to offer to its customers unadulterated oils, it helps health practitioners who use essential oils in their regimen to know what's in their oils and calculate concentration accordingly and it also helps the artisans who use essential oils in their craft. Ideally, this also implies that a GC report is not only a paper that is put into a pile and forgotten. For this, you must learn how to read one. Here is a small primer on what to look for and what information you can get. First of all, I want to clear something up. A GC report won't show quality. A GC report will only show purity. Why so? A GC report quantifies values, usually percentages of each component. These values are a representation of something that is tangible, that can be measured. Purity can be measured since it has known parameters: no synthetics, no diluents, no contaminations. Quality on the other hand has no parameters, it is in the eye of the beholder. Something of high quality for one application will not necessarily be good for another one. A good example of this is the Android vs iPhone debate, the quality of the iPhone is low for an Android user and vice-versa. Quality is a matter of opinion while purity is a matter of fact. What about the ISO/AFNOR norm, they have number on them? ISO and AFNOR norms put limits on physical value, yes, but they are a subset of quality. Norms like these will be useful for those who give them value, some very good oils for some will fail the ISO and inversely some very bad oils will pass. In the end it always depends on what you are looking for. I also want to mention that we will use one of our reports as an example but most reports from other labs will have more or less the same information and will read the same way. Date: This is the date the report was made. Internal code: This is the code that the lab uses to track the sample internally. Each lab has its own codification method. Customer identification: This is the code that the customer gave to the sample. Usually it contains the common name of the source material, country of provenance, lot number, etc. Type: We indicate if it's an essential oil, hydrosol, extract, etc. Source: This is where we indicate the binomial name (latin name) of the source material, as given by the customer. This is often a very short part that gives a bit more information on the lab side. It may contain more information, it may contain less. There is some that should be required though. Method: This explains the method used for the analysis. In some cases it will be more explicit with the analysis parameters written, in some cases it will be omitted completely. We choose to put a reference. The full method is available on request. Analyst: This should always be present, in one way or another, it indicates who made the analysis. This is important for tracking the sample. Analysis date: This is also important, it indicates the date the sample was analyzed, usually on the instrument. If there is a problem with the instrument this helps us track which sample may also have had a problem. This is the heart of the report and where most of the information is. It will list all components found with their relative percentage (note: not the absolute one, this is explained in previous blog entry). The example shown here was truncated for the sake of simplicity, so the percentages may not fit. Identification: This lists the names of the compounds found. In this section you may look for the compounds that are of interest to you. Not all compounds may be important in the report, but some contaminants and adulterants are found in a minor level and we must therefore try to identify as much as possible. 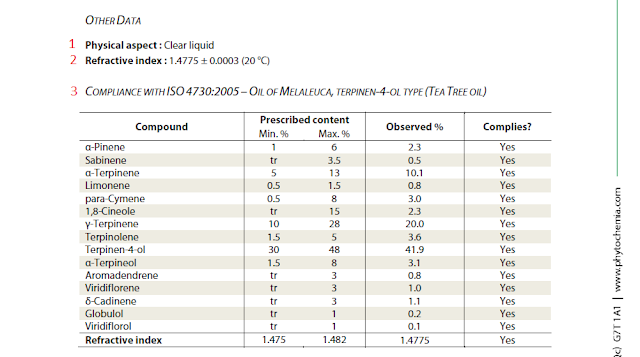 There are many ways to determine which compound is important, you can search through the EOUdb, books like Robert Tisserand's Essential Oil Safety and norms like ISO/AFNOR. If you want more academic sources, you can also search in peer reviewed journals like Journal of Essential Oil Research or Flavor and Fragrance Journal. You can also ask your local specialist or use your own experience. You may also see a name like this: Unknown (m/z = 71, 43 (86), 81 (86), 79 (69), 67 (67), 41 (56), 53 (38)... 152 (7)). This means that we do not know the exact structure of the compound but we can often guess part of the structure by the mass spectrum. The number in parenthesis is for the most abundant peaks. This is mostly for us and other academics, as new compounds are discovered, their mass spectrum are published and may allow for eventual identification. (Note: this happened recently for Pogostone in Patchouli oil. Pogostone mass spectrum is not found in most databases and we were eventually able to identify it, partly by luck, while reading the literature.) In some cases we will also indicate something like: Carvacrol isomer or Sesquiterpenic alcohol. This means that with the MS we are able to determine the base structure but not the precise one. Another symbol that you may find in our report is a "?" after the name, this indicates that we may have a small doubt on the identification. Usually this is in a situation where the MS database gives us a result but other identifying parameters are not fitting perfectly: the RI is off on one or two columns, or the structure doesn't fit biosynthetically (we should get back a bit more on this later). Usually this is on very minor compounds. Column identification: These two columns contain the data for each GC column. R. T.: This is the retention time in minutes for each peak. These may vary depending on column use and age, and will usually shift a bit when we install a new column. They are usually not an identifying factor. R. I.: This is the retention index for each peak. This is a normalized retention time and will shift a lot less due to column aging and change. As we already explained in a previous post, this is one of the values that we use to identify a compound. %: This is the relative percentage for each identified compound. You will notice that there is a value for each column used. These two usually fit together but some variation is expected. 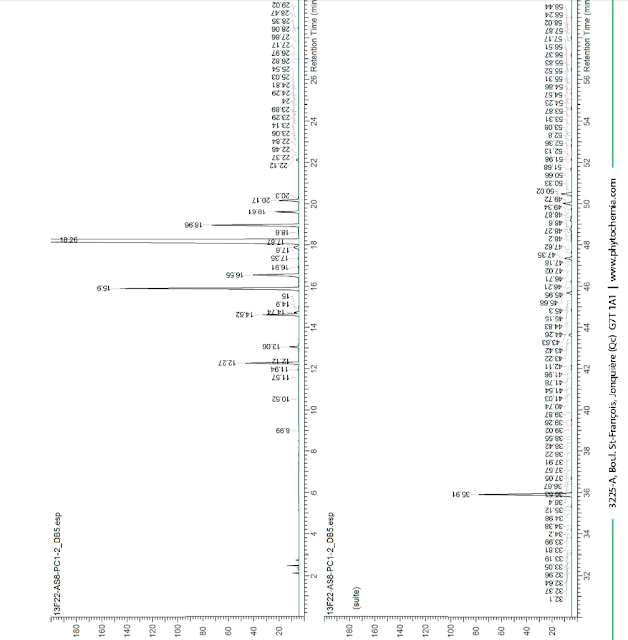 By convention we always use the BP5 column (the apolar column) due to its greater stability. We will get back to the number in brackets a bit late. Molecular class: This is the molecular class for each compound. We try to standardize these the most we can but there may be some exceptions. Usually the first part is the biosynthetic pathway and the second part is the oxidation level. Total identified: This is the total percentage of identified compounds. Please note that we will never indicate 100% here since it is virtually impossible to identify 100% of the composition of something as complex as an essential oil. There will always be minor compounds that are either unknown to the community or that are too minor to be identified without a doubt. Correction factor: We include a note that there is no correction factor used. For more information on the correction factor check here. Coelution: In some cases two compounds will coelute. This mean that they won't separate on the GC column. 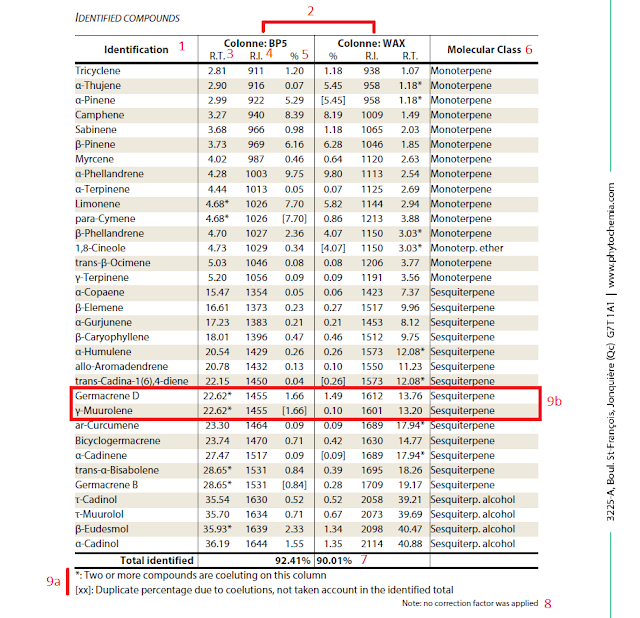 When we detect such coelution, we put the percentage in a bracket and add an asterisk to the retention time to indicate that they are the same peak and that therefore the percentage is not representative of each compound but of the mixture of compounds. To know the percentage of each individual compound we must look at the percentage on the other column. Usually if you add the corresponding value of the other column they will add up to the total on the other column. In some uncommon cases, there is coelution on the two columns, it is often possible to still calculate the concentration of each compound individually by a bit of algebra. In some rare cases it will be impossible to determine the concentration of an individual compound since there will be interfering coelution on the two columns. This part of the report contains all the other parameters and is kind of a melting pot. It usually contains the refractive index, the physical aspect, the ISO norm comparison (if requested), etc. It is also the part that is often removed when we shorten reports. Physical aspect: This is an estimation of the coloration of the oil, since this is very subjective it must be taken with a grain of salt. Refractive index: This value is a quick and easy way to check between lots. Compliance with norm: This shows each compound’s need for the norm, their prescribed range and observed value. It is a case by case basis, and not every oil has its norm. As explained before, this is not necessarily a proof of quality. This part has the conclusion and our remarks. It also contains one of the most important parts of the report: the digital signature. Sometimes other small notices and provisions are added there as well. Conclusion: This contains our conclusion and remarks, when we have any. Usually when everything is all correct we simply write: No adulterant, contaminant or diluent were detected using this method. This is also where we sometime explain some of the results, if needed, and cite publications. Signature image: There is more than meets the eye in this image. When you double-click on the image there should be a pop-up appearing when in Adobe Acrobat, indicating that the document was not modified since it was signed. It is practically impossible to change any data in the document without it showing (there are theoretical hacking attacks but none were successful in reality). This is very important since it proves that the version of the report that you have is the same that the chemist made and validated. Note that it will say that the signing entity is unknown unless you add the certificate to your list of approved list. To see how to do that and to have more information on the electronic signature please check here. Signer name: This is the written signature of the chemist who validated the report, it may be different from the one running the analysis. In Québec we have a professional order for chemist that legally binds us in regards to our results and conclusions, so we also include our unique registration number. This part is simply images of the chromatograms. This is useful if you wish to quickly compare the profile between lot and batch. There is not much to explain without getting too technical so I will leave it as is. This concludes our little primer on how to read a GC report. I hope that it was clear and it helped you understand the importance of those reports. Feel free to comment or ask me any questions that you would have. Good article. There was a study done recently on the volatile constituents of hashish in which 5,5-dimethyl-1-vinylbicyclo[2.1.1]hexane was detected as a photolytic product of Myrcene from the production process. The researchers proposed to change its name to Hashishene, so I've been using that name recently. I thought you might find it useful or interesting. Here is the link to the paper. We saw this article and it is very interesting. We actually found the reference to 5,5-dimethyl-1-vinylbicyclo[2.1.1]hexane in the doctoral dissertation of Michael Paul (http://scidok.sulb.uni-saarland.de/volltexte/2012/4999/pdf/Dissertation_Fertig_211112.pdf) who found it in Boswellia sp. essential oil. It is almost always present in this oil. We actually though of using Hashishene as a simpler name but since the Cannabis article is very recent we are waiting a bit to check if the name take some steam before. We recently decided to add "Hashishene" in addition to the systematic name to our reports. We believe it would indeed be a better name, but simply want to wait for the name to gain greater acceptance. We've found it to be a not so rare compound, in fact. We often observe it in spearmint and frankincense oils, in particular. This is a great blog. Where is the first part of this series? I have checked through the tags, and not found it.